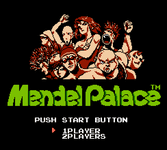 Mendel palace is a cooperative puzzle game. The main character's significant other has been mysteriously capture and must be rescued. Player(s) tread through top down levels on a 5x7 grid and destroy a myriad of enemies by pulling floor tiles from under them.